Welcome to the ANZ LitLovers blog. It started out as a blog for an online reading group, and while it still retains its role as a portal to the group, its primary function now is as Lisa Hill’s ANZ LitLovers LitBlog (ANZLL) – where you can find reviews and commentary about literary fiction, classics and (less often) non-fiction from Australia and New Zealand. There are also regular blog posts about contemporary international fiction with a special interest in translations, and the classics. Lisa Hill is a keen reader who lives in Melbourne, Victoria. Her natural habitat is a library. (She has one in her own home.) When not reading, she can be found buying, coveting, sorting, re-arranging, cataloguing, blogging or talking about books, with occasional trips overseas to admire other libraries. These activities are interrupted only by having to go to work, but after a long career in teaching she has finally found a way of combining the two by working as a primary school librarian, necessitating reading books to 16 classes a week and more buying, coveting, sorting, re-arranging, cataloguing, blogging or talking about books. Not any more! I retired, at the end of December 2014. Lately, Lisa has also found a way of meeting her favourite authors by doing the occasional book launch and chairing panels at Literary Festivals. Get in touch if you need someone who has, or definitely will (a) read the book or (b) know how to bring a panel together to talk about books. The ANZ LitLovers blog won the Words category in the Best Australian Blogs Awards in 2012, and has also been featured in ‘Bookworms on the Web‘ by Jane Sullivan at the SMH. This blog is maintained by Lisa Hill. Ramblings, reviews, rants and raves are all by Lisa Hill unless otherwise noted. I aim to be transparent about the reading choices I make. I don’t read to any agenda, I just read what appeals to me. But I track the gender of the books I review (look under Reviews in the drop-down categories box where the ratio usually hovers around 45% female 55% male) and because it’s come to my attention that female translated authors tend to be under-represented, there’s a special subset for translated fiction (trending up from 20% female 80% male). I also track the gender ratio of my Meet an Aussie/Kiwi Author profiles (hovering around 50/50, without any deliberate manipulation from me). I track indigenous authors separately too. Publishers and authors wishing to submit books for review, please visit the Comments and Reviews Policy page, then use the Contact Form below to get in touch. Transparency statement: I belong to Fishpond’s Affiliate Program. I receive a token commission if you buy a book using links to this bookseller, or if you visit Fishpond via the logo on the site and subsequently buy a book from them. Any commission received in this way contributes a modicum towards the ISP costs of the ANZLL website, towards the subscription that I pay to keep it free of other intrusive advertising, towards the exorbitant cost of posting books to my friends here and overseas and towards my compulsive book buying habits. For more information, see my post about this. To support Australian publishing, links to the Fishpond Affiliate Program go to Australian editions of the books as much as possible. This is to support local online suppliers of Australian and New Zealand books. Fishpond offers free postage on every order. As of April 2014 I no longer have any affiliation with any international bookseller, and am progressively removing any remaining links from this site. The Australian Copyright Act 1968 (the Act) allows 10% of the number of words on this website to be reproduced and/or communicated by any Australian educational institution for its educational purposes provided that the educational institution (or the body that administers it) has given a notice to Copyright Agency Limited (CAL) under Part VB of the Act. For details of the CAL licence for educational institutions contact: Copyright Agency Limited, Level 15, 233 Castlereagh St, Sydney NSW 2000 Ph 612 93947600 Fax 612 93947601 Email: info@copyright.com.au Except for personal use or as permitted under the Act (e.g. for the services of the Crown or in reliance on one of the fair dealing exceptions i.e. a fair dealing for the purposes of research or study) no part of this website may be reproduced, stored in a retrieval system, communicated or transmitted in any form or by any means without prior written permission. All inquiries should be made to the copyright owner Lisa Hill at using the Contact Form below or as attributed on individual blog posts. ANZ LitLovers is an online reading group for Australian and New Zealand lovers of literary fiction. Members are keen readers of all ages who discuss books and book-related topics by email. Members come from all over ANZ, but gatherings take place whenever the opportunity arises. Bookshops and writing festivals are popular venues. ANZLL defines ANZ literature as any book of literary fiction written by a Kiwi or an Aussie, (including expats) or set in Australia or New Zealand. The group chooses mainly contemporary literary fiction, but includes a ‘classic’ choices and occasional international titles, and enjoys friendly and relaxed chat about other books we read as well. Members nominate books for discussion, and vote at the end of each year. While it is not expected that everyone will join discussions for every title, all members are asked to contribute regularly to sharing their BBRLM (Best Book Read Last Month) and annual Top Tens. ANZ LitLovers was founded in January 2002 by Kim Dwyer (at left) in Noosa, Queensland, and Lisa Hill in Melbourne, Victoria. 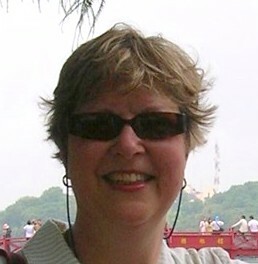 After a long struggle with breast cancer, Kim died peacefully at home with her family on May 13th, 2005.
her passionate opinions about the world’s injustices, and her wisdom. Those of us who were privileged to know her will never forget her. 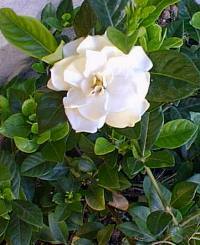 Gardenias were her favourite flower. This one blooms in Lisa’s garden in memory of Kim. No Gerald Murnane on the read before you die list. An oversight, because as you know if you have browsed this site, I am a fan of Gerald Murnane’s writing! I shall fix this immediately, and thanks, Tim, for bringing it to my attention. It’s HERE if you’re interested. I have just [excitedly] stumbled across this blog and am thoroughly enjoying reading back through the posts. In case you should ever stumble across mine, I wanted to let you know that I didn’t steal your header idea. I just thought I was being creative. I’d like to think it is a case of ‘great minds think alike’ but, on reading your posts, I confess that my mind is a lot less focused. I came across a blog of yours enquiring about Robert Carter’s book ‘Prints in the Valley’. I am still alive. Happy to send you a biog re my books if you are interested. Yes, please, Robert – that would be great! Lisa Hill – you amaze me. How quickly do you read and not only that how quickly do you come up with words to review them. Plus you have a ‘paying job’ as well! My mind is just overwhelmed thinking about that. I am new to reading books (not that I’ve never read), but my increased reading is due to joining a book club, and volunteering to help out at a book shop that opened up locally. Reading through your blog, I feel like a fraud, but I will perservere and not lose hope that maybe one day I can say I am a reader of books. In my usual tech-challenged way, I have been trying to find the post on your blog that made mention of a service you used (I think) to draw a winner. At least I think I read it on your blog but I could be totally wrong. I am running a survey comp on my blog (survey monkey) and didn’t think about the correct way to draw a winner. Hi Karen, I didn’t bookmark it but if you Google ‘Random Number Generator’ you’ll find any number of free ones. I didn’t need to download anything for the one I used, I just typed the numbers in. Thanks heaps Lisa, it is actually at the end of the Leonard Cohen Concert Review post but I’m going to put it up again in a new post shortly. Lisa – I didn’t see an email, so hope you check this comments section! Could you please recommend a book on the history of Botany Bay, the HMS Endeavor and Cook? I thought it might be more likely that Australia would have a book that hasn’t been published here in the states. and a good review here http://webdiary.com.au/cms/?q=node/3029. Just a note to apologise for my sudden departure from the book blogging scene. I plan to relaunch my site in due course focusing on just a few favourite authors – based on some of my more indepth reviews. I thank you for your frequent comment on my book reviews which were always much appreciated. I’ll keep dropping in to ANZ LitLovers to what you’re up to there. Hello Tom, that will be an interesting new focus, will it be the same website address so that my existing RSS will feed it in to my email? I left a note for you on librarything – just checking whether you found it. I’m leaving for France in a couple of days. A year in France. In a tiny walled village. Intermittant slow internet. Writing a book. I’ve more-or-less abandoned LT, it’s too clunky for me, so I’m glad you came by here as well. Your sojourn sounds like heaven! What sort of book will be it be? I’ll be in Paris myself later on this year, I’ll wave to you as we fly over! Alas, I’m only in Paris for a stopover of a day or two (just long enough to have a decent meal after a fortnight of cabbage and potato in Russia LOL) and then we fly home. Lisa – we’re coming home for Noel and then heading back to Sablet, France. I have one carry-on suitcase. I plan to ditch all my clothes in Australia and fill the return carry-on with books. Ten suggestions, please – Australian authors, published last year .Literary is nice, Fc or non-fic. Oh Sylvia, what fun! Some lucky person gets a suitcase full of gorgeous French clothes and I get to choose a shopping list of lovely books! I’ve got my hands full today because I’m chairing a panel at the Stonnington Festival, but I’ll put some thought into this and will reply properly in a special post just for you ASAP. Are you going to review The Voyage by Murray Bail? I do value your reviews. I certainly am going to review The Voyage, I loved Murray Bail’s last book and this one is my next read after I finish my current novel! If all goes well I expect to finish Whisky Charlie Foxtrot in the next day or two and then I’ll be starting the Bail. what a great blog. im so glad i came across it! Hello, and welcome! It’s always a pleasure to find that others share my love of Aussie lit and want to help spread the word. http://www.booktopia.com.au/gotland-fiona-capp/prod9780732297572.html Let me know if you would like me to send you a copy for review. Thank you for your offer, but I have already bought Gotland, and will be reading it just as soon as I can get to it! Lisa: This comment is a follow-up to your comment on my blog. For some reason, I couldn’t see or respond to your comment on the blog itself, although I saw it in my notifications. (?). Yes, I originally taught Mahfouz “Palace Walk” in this course and students were appalled by the sexism. I was, too. It seemed even more pervasive than the sexism in “Things Fall Apart.” I do think Mahfouz was critical of the dad’s tyranny, but still, it left a bad taste. That’s one reason I decided to teach something different from Mahfouz. The other reason is because “Palace Walk’ is soooooooo long! On the issue of Kinna Reads, I follow her blog and participate in her African Reading Challenge but I had no idea she is the daughter of Ama Ata Aidoo. That is so cool. How did I not know that? I think it is so sad that courses today can’t set books that are of any serious length. I understand why, but it means that students are missing out on some of the world’s great books. It is coming to something when one answers a couple of simple questions, to have one application refused. That’s what happened when I tried to join Linked In ‘Now’. Clearly, unbeknownst to me I have sullied my escutcheon, rendering me persona non grata. Oh, well. Such is life, as Ned Kelly is reputed to have said at the moment of his being hanged. But you are welcome here, to chat about books any time! Further to my immediately preceding e-mail, earlier today I tried to send an e-mail and scan, but they went to the wrong Lisa Hill. All I need is yur e-mail address. Any hope? My email address is at the bottom of the RHS menu right down at the bottom in the yada yada about copyright. I hide it there to deter spammers. Many thanks – I shall go a’huting instanter. Re the scan – you don’t actually have to do anything with it. Well, if you are in a generous mood you can say “Well done!”: but otherwise, you know where the Delete icon is! *chuckle* You left the ‘m’ off dotcom! PS I’ve edited your comment to remove the email address even though it doesn’t work, because a spammer would very quickly find it and fix it. I had to come read your about page because you post a review pretty much every single day! I thought for sure that multiple people must contribute to this blog. It just turns out that you are a power house! Do you ever have the time to read other book blogs? I love developing relationships with book bloggers and sharing reviews. I read reviews carefully and comment quite frequently. LOL Melanie, I used to have a split personality when I was at work and had to pretend to be normal (though my sweet, patient colleagues would dispute that I succeeded in that). But since retirement I am free to be me, which means that reading and writing are my default activities, with normal life tagging a long way behind. Yes indeed I do read other book blogs, it’s part of my daily life. All the ones I’ve subscribed to (I’ve lost count of how many there are) pop up in my email inbox, and Twitter which I look at first thing in the morning after I’ve finished about an hour’s reading. I scan the emails, delete or ignore anything that doesn’t appeal e.g. crime and then head over to all the ones that intrigue me. I read ’em, I comment on ’em, I waffle on about the book they’ve reviewed if I’ve already read it, and I add the book they recommend to my wishlist at Goodreads or I order it from the library or I buy it online. I try not just to ‘like’ a review, I think if my friends have bothered to write it, I can be bothered to comment on it. But occasionally real life gets in the way so I have to be pragmatic about that. I don’t suppose you review poetry? I am not brave enough to do that and would love to have some poetry reviews on this blog. Lisa, you sound entirely delightful! I do SOME poetry. If it’s newer or experimental, it’s a definite no…which, that’s most stuff these days. I have a few people I contact to write reviews for me if I have someone who really, really wants a poetry review done. However, I do have a few poetry collections that I own that aren’t experimental and wouldn’t mind reviewing! Is that the kind of thing you meant, or did you have specific poetry collections you wanted reviewed? Occasionally publishers who ignore my review policy that says I don’t review poetry send me collections, And because poets get so little publicity I always feel guilty about not doing anything with them. Hmmm, if I read a collection, I will contact you! I am currently reading the complete Paul Laurence Dunbar, if you’re interested in having older works of poetry on the site.